The plans and outtakes are then transitioned into execution work blocks. My experience in facilitating these processes is that management teams tend to overvalue the allure of the future state and under-explore the current strategic position. Current capabilities are overstated, the challenges that require overcoming are under-understood as is the capabilities building process and time needed to execute on the plan.Strategy frameworks, while very useful, need to balance the tension between where you are and where want to be and the potential options you have to get there. They do so by critically analyzing your incumbent positions and making the future state as definitive as possible. At a minimum, these are two anchor points. Change your definitions of either and you impact the staging path options. In so doing, a critical strategy construct is never made explicit. The core commercial idea that the business is underpinned by. This is typically experienced in larger established businesses where the founding idea has been lost in the diversifying trading portfolio and morphing strategic narrative. Emerging opportunity tackled through innovation enabled products, business and operating models increasingly drive the agenda. 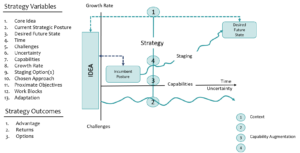 Failing to explicitly recognize or engage the idea layer in the strategy process, removes a critical and deeply influential starting construct. 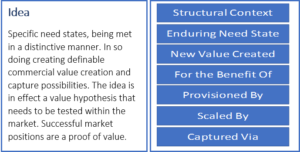 The commercial hypothesis that strategy needs to enable in a differential and value accretive way. The idea to strategy link matters for 3 important reasons. Firstly, strategies enable ideas and the value that is seeded within them. Any current state analysis needs to explore not only the strategic posture the business has accrued to date but also the ongoing relevance of the core idea. A proven commercial idea is invaluable. The way it is expressed and consumed in the market may change over time and its strategies role to manage this process. In essence, a business has the ability to back the same idea as competitors but enable it via a unique strategy or, back different ideas. The array of super-car brands is an example of the former, Amazon the latter. Secondly, a future state position, needs to reflect a “made manifest” version of an idea. A future state position is an expression of something more fundamental. While appealing, a compelling blue-sky vision devoid of a sound commercial idea provisions limited guidance for good strategy. Thirdly, ideas give guidance to two important variables – the generic challenges that need overcoming in their pursuit and what adjacency ideas, emergent or otherwise, fit the incumbent and proven idea architecture. Sustainable growth is best achieved through the augmentation of a proven idea. A strategy precursor is the reconciliation of an emerging opportunities within the context of what has worked. Strategy in practice needs to address and integrate 13 key variables. (See diagram). The outcomes of strategy in process is 3-fold. The ability to foresee and overcome challenges and constraints while delivering the ideas proposition in a unique or differential way. Generating a stream of hurdle exceeding financial returns over time. Increasing the future state option set positions in ways that enable greater growth potential and incumbent asset set leverage. The integrity of the strategy planning process is thus anchored within your hypothesized value and immediacy of what needs to happen in the proximate future. Capability building within the context of identified challenges and the chosen approach(s) being grounded in good strategy practice.